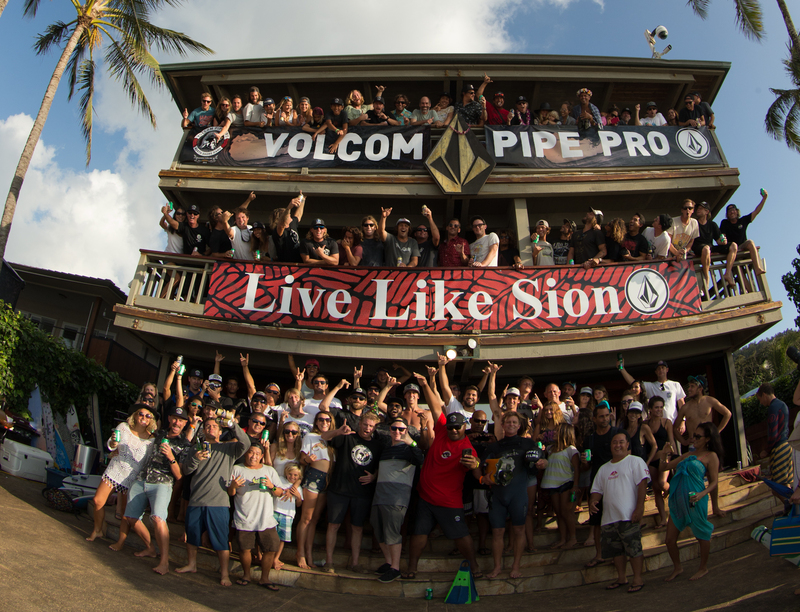 Banzai Pipeline, North Shore, Oahu, HAWAII – (Tuesday, February 2, 2016) – Kelly Slater (USA) solidified his first win in two years at the Volcom Pipe Pro today after a full day of standing ovation performances that many are calling the absolute best of the winter season. 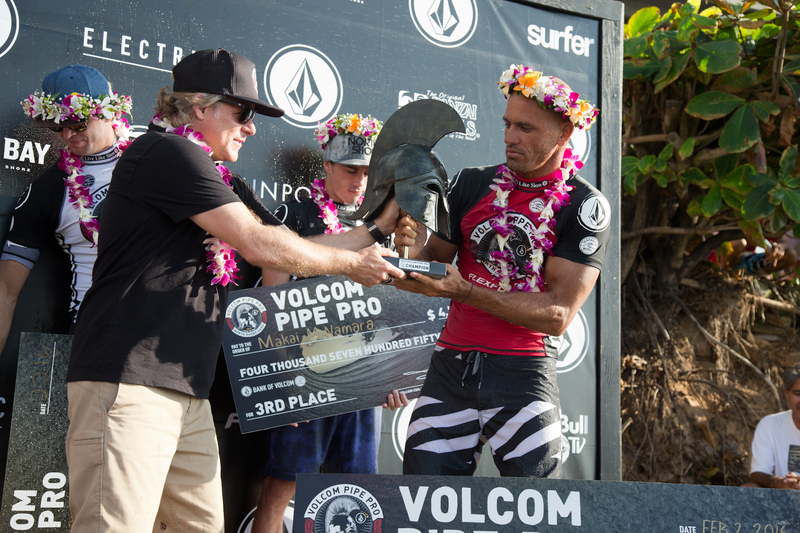 Slater surfed against three of the top Pipe mavericks in the world – Jamie O’Brien (HAW), Bruce Irons (HAW) and Makai McNamara (HAW) in a nerve-shattering Final that saw barrels fire off like cannons and detonate on the notoriously shallow reef. The 30-minute Final got started with two low scoring albeit immense waves from O’Brien and Irons, respectively, then saw McNamara answer back with the second highest wave of the heat, an 8.67. The 20-year old took an early lead on his opening wave, with Slater taking a quick second on his first ride, a 7.83. Halfway through the Final, the 11-time World Champ secured the win with a backup score of an 8.73, while the other competitors fought hard for the runner-up position. O’Brien scored a 4.27 for a long left, finally finding a barrel in the second section of the wave, and backed up the mediocre score with a 5.67 for an inside Backdoor barrel. The combined heat total of 9.94 secured a second place finish for the Pipeline Master. The first perfect ten of the day – and the third of the event – O’Brien routed an ultra deep backside barrel to claim the Electric 10-point ride award for $1,000. Calm and cool, O’Brien was in complete control while navigating a high line, eventually bursting out of the tube after the spit. Marco Giorgi (URY) nabbed one of the highest scores of the morning, a near perfect score of a 9.67 for a tricky Backdoor barrel that threatened to clamp down. Giorgi is the sole surfer hailing from Uruguay in this competition. Tom Whittaker (AUS) was the highest placing Australian of the event, surfing in the fourth Quarterfinal against Jamie O’Brien (HAW), Mason Ho (HAW) and fellow countryman Soli Bailey (AUS). Baily, 20, had the opportunity to surf one of his first Pipe events in excellent conditions and was humble about the experience. Wiggolly Dantas (BRA) narrowly missed a shot at the Quarterfinals after being taken out by Makai McNamara (HAW) who advanced behind Mason Ho (HAW). The Brazilian is a standout in North Shore waves and has spent the winter honing his talents here at Pipeline.